Classic Movement Fun! Parachute activity encourages participation. 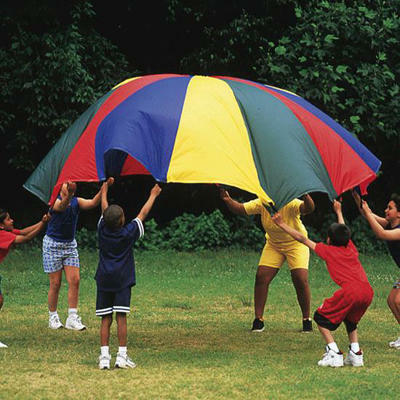 Whether they are sending balloons sailing, or rolling a ball around and across the parachute, children will have a great time. Sewn-in web handles around the edges make these parachutes especially easy to hold. A mesh-covered center vent allows air flow for controlled action. Excellent for use with foam balls or balloons. Suitable for inside or outside use. Can be used in a standing or sitting position. Accomodates up to 12 players.